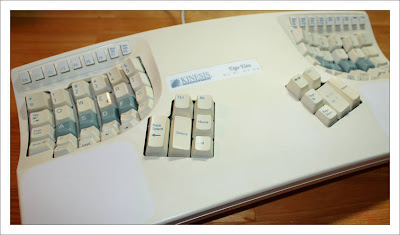 I really like my Kinesis Ergo Elan keyboard which I bought about 12 years ago. It is old enough to have a 5-pin DIN connector with PS-2 adapter, which is now plugged into a PS-2 to USB converter. I use it at work, so it has had more than 10 years of continuous use without any real problem. 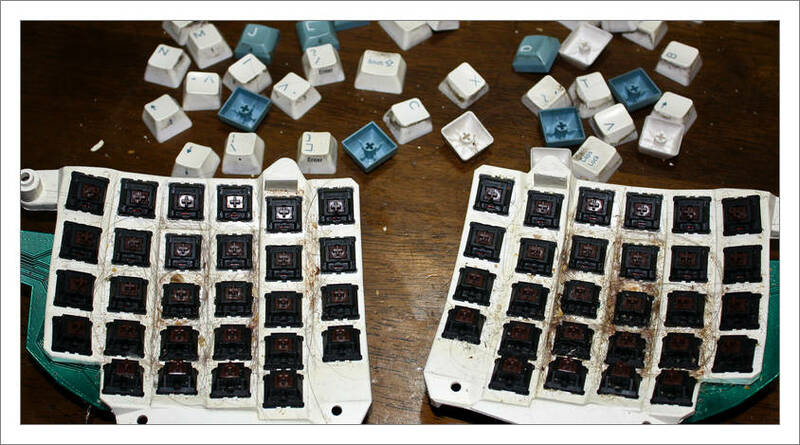 However, it was starting to look a bit grotty and the escape key was a bit sticky. Then the other day some keys stopped working so I thought it was time for a good clean. The only way to get all the muck out was a complete disassembly. Fortunately, the Kinesis keys come off fairly easily. 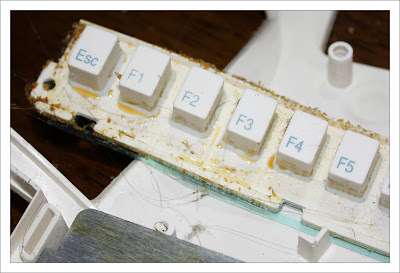 The cause of the sticky escape key was very obvious once it was dissasembled - some sticky mess all around the contacts. 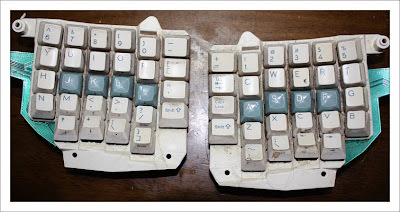 Most of the keyboard is screwed together but the function keys were held in place by plastic lugs which had been melted over the backing plate. Not a good design for easy disassembly. So it was necessary to cut of the top of the lug to take the function key assembly apart and then glue it back together. Once all the keys were removed, they could be cleaned and all the grot removed from underneath them. Key switches with keys removed. The keyboard cleaned up pretty nicely. The plastic is slightly yellowed and the legend on the "enter" key is slightly faded, but considering the use that this keyboard has had it is in remarkably good repair. I have just ordered the newer model (the Kinesis Advantage) for use at home, to replace the Microsoft Natural keyboard that I have been using.